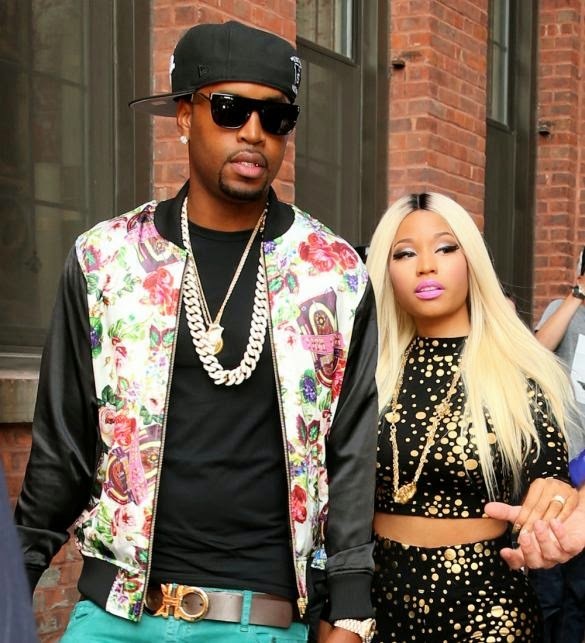 Nicki Minaj and Safaree Samuels have reportedly split after more than 10 years together and it was not an amicable split. It looks as though Nicki was the one that did the dumping though Safaree was the first to publicly reveal the relationship was over by showing last week that his tattoos of Nicki had been covered up. With none of them saying anything officially, speculations have been rife on the reason for the breakup ..
Nicki ended the relationship as Safaree became “uncontrollably jealous of her success” and reportedly wanted to seek fame and fortune in his own right. The straw that broke the camel’s back though was when Safaree failed to show up at one of her recent shows to perform his usual task of hyping up the audience, sparking a huge argument between the pair when Nicki, 31, confronted him and he is said to have not taken it well. "She started screaming, he got pissed, and she exploded in anger, grabbing a bat and chasing him out of the house. She then smashed the windows of his 2012 Mercedes with a baseball bat, threw his clothes in the garbage. Cops were called to the house, but no arrests were made. Safaree was escorted out of the house and left. As for why Nicki didn't get in trouble ... it appears she owned the Mercedes, but allowed him to use it, and you can't get arrested for destroying your own property. They broke up a short time later." The pair are thought to have dated for more than a decade with Safaree ever present throughout Nicki’s career over the last five years, appearing on stage with her during her concerts acting as her hype man and becoming well known to her fans. They seemed to be inseparable and rumours even began floating earlier this year that they were engaged or married after Nicki was seen wearing a ring.